The salmon continue to mill around the estuary with the extremely low river levels. You are already seeing a lot of fish jumping, which indicates that they have been there longer than they should. It can be challenge to catch this fish but by no means is it impossible. At some point of the day, with the right fly at the right moment can entice a strike. Lots of fresh fish will still move in until the end of September and you will encounter more wild and bigger fish. Pinks continue to roll in both at Ambleside and Furry creek. This is the time that you might hook a chinook as well as they will be joining the coho and pink salmon. The tides are low in the afternoon until August 17th and then off the beach and it is good again after the 23rd so until then fish off a boat at Ambleside or head out to Furry creek if you are beach fishing. George and Reese on a successful guided trip at Furry Creek. 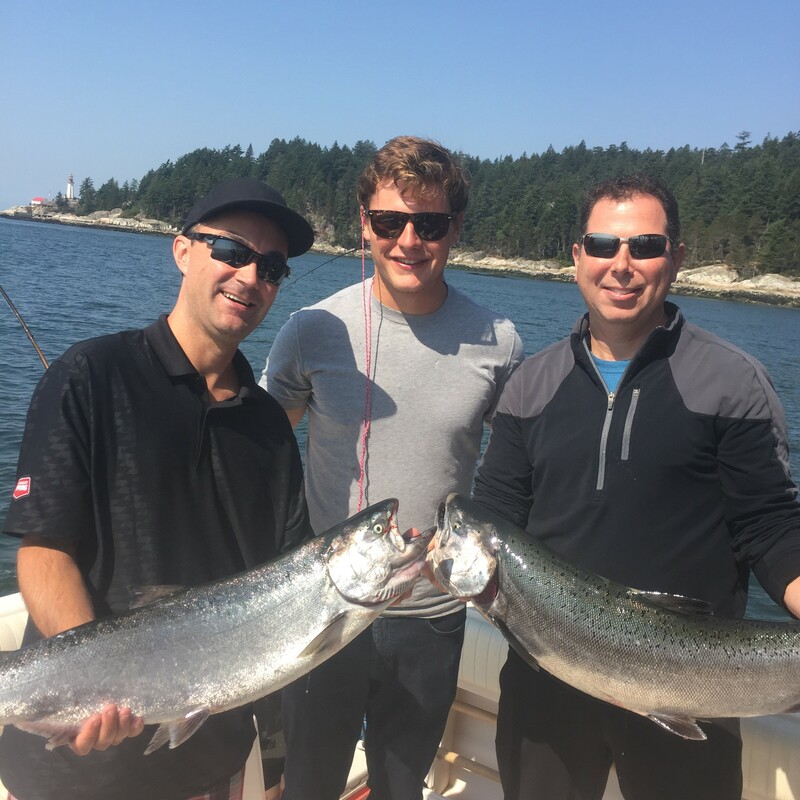 The chinook fishing is now in full swing and there has been some great catches this week at the Bell Buoy, North Arm, T-10 and Sandheads (South Arm). Thursday was extremely hot, with multiple boats getting into double digit numbers of chinook in the 10-25 lb range, mostly reds, with the odd white. The hot presentation has been bait (anchovies or herring) in a glow green or glow green chartreuse teaser head. Hot flashers have been anything with glow tape and some green, chartreuse or blue blades. The Oki Tackle Footloose in blue or green have been productive. They have a reflective UV tape on one side and glow tape on the other side. If you run out of bait, spoons and hootchies will work. The Pesca Basketcase has accounted for some nice fish this week as well as a white glow or just plain glow hootchy. Productive depths have been 30 to 80 on the riggers with most of the fish in 50 to 65 range. There have also been some hatchery coho around as a bonus and of course lots of pinks. We have all the hot flashers and teaser heads in stock and we also have lots of herring and anchovies in different sizes, including 3 sizes of herring and 2 sizes of anchovies. So if you need to get geared up for the hot chinook action, come by the shop and grab your gear and get the latest report as our 3 boats are on the water everyday. 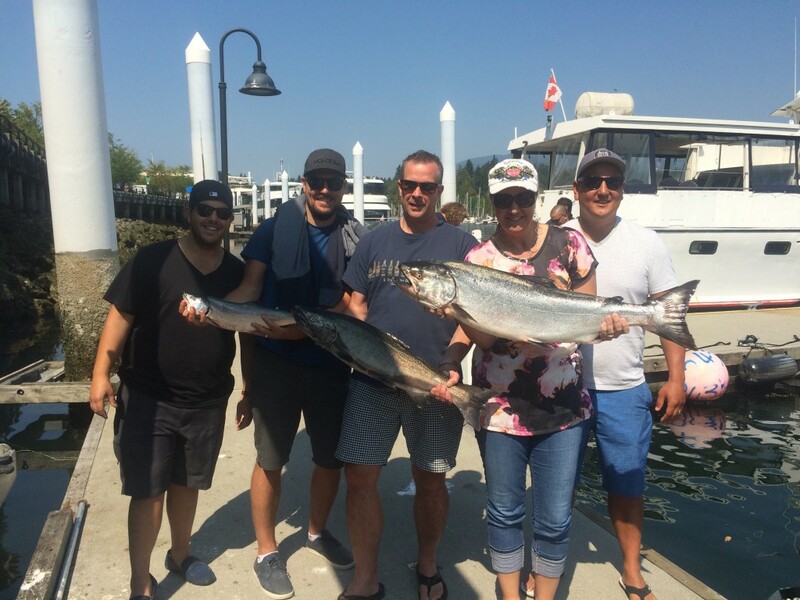 Dimitri’s guests with their afternoon catch! While we always get excited about the chinook fishing down at T-10 and Sandheads, there is still lots of hot action off W. Van and the Bell Buoy. 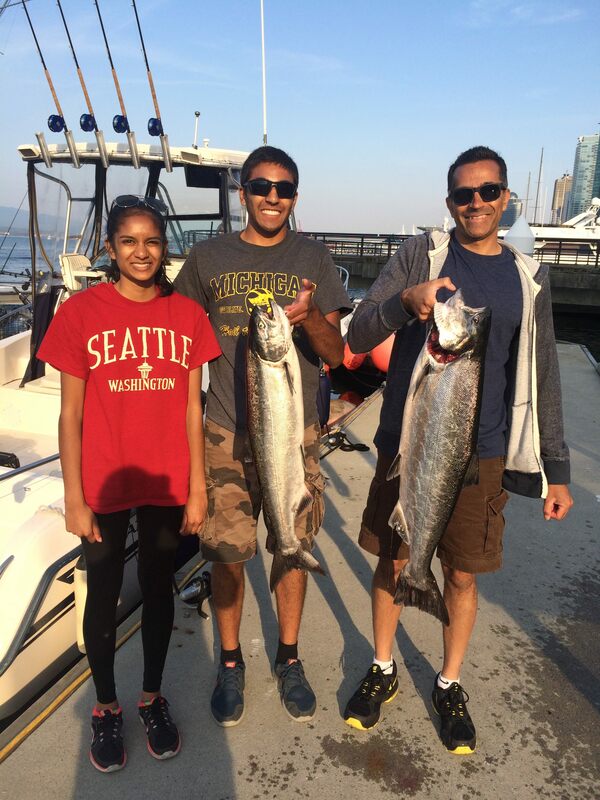 On Thursday we were out on some 5 hour charters and we were into multiple chinook on both boats as well as coho and pinks. The chinook were reds, so Fraser fish that have been pushed into the harbour on the big tides this week. So you just never know what you are going to catch from Point Atkinson down to the Cap Mouth. There are definitely lots of pinks around in that area as well, so if you want to target these fish just put on a pink spoon, pink hootchy or pink Apex. 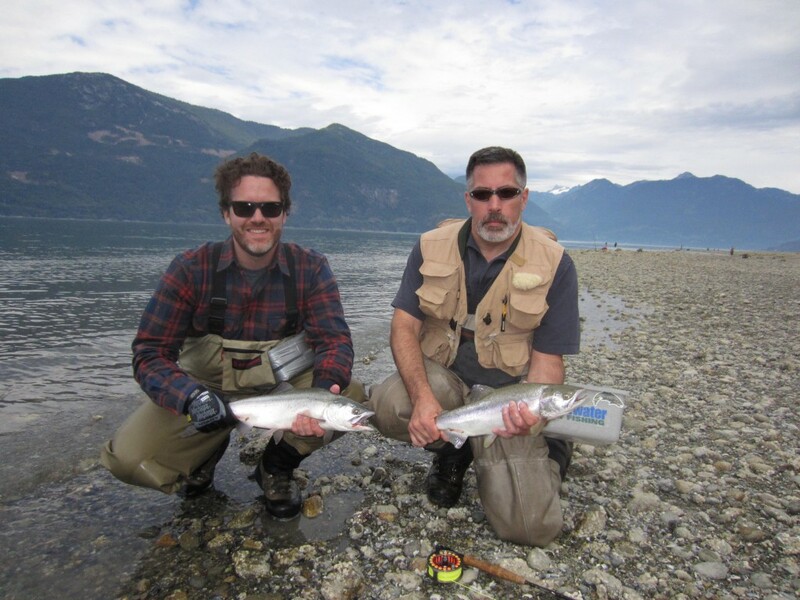 The fly fishing has also been good and if you cruise along the shoreline of W. Van in the Pink Apartment area, you can locate schools of eagerly biting pinks that will respond well to a pink fly or a small pink spinner or spoon. The coho are getting tougher to catch, but we are still getting coho on white hootchies and bait starts to work well for the coho this time of year as they get stale and picky. If a run down to T-10 or Sandheads is not in the cards, or it is just too windy, you have a good shot at chinook off the Bell Buoy. The same flashers and teaser heads work here as discussed in the previous paragraph. They are the same Fraser chinook that get pushed into the harbour on the tide. There have also been some good sized schools of pinks in this area as well as a little further out off the QA marker. A great day out on the water this past Thursday!